Film recording and complete transcript with slides is freely available. Opening summary excerpts follow. In 1945, Albert Einstein said, “The release of atomic power has changed everything except our way of thinking.” In 2015, seventy years later, we are still stockpiling nuclear weapons in preparation for nuclear war. Our continued willingness to allow huge nuclear arsenals to exist clearly shows that we have not fundamentally grasped the most important truth of the nuclear age: that a nuclear war is not likely to be survived by the human species. A war fought with 21st century strategic nuclear weapons would be more than just a great catastrophe in human history. If we allow it to happen, such a war would be a mass extinction event that ends human history. There is a profound difference between extinction and “an unprecedented disaster,” or even “the end of civilization,” because even after such an immense catastrophe, human life would go on. But extinction, by definition, is an event of utter finality, and a nuclear war that could cause human extinction should really be considered as the ultimate criminal act. It certainly would be the crime to end all crimes. The world’s leading climatologists now tell us that nuclear war threatens our continued existence as a species. 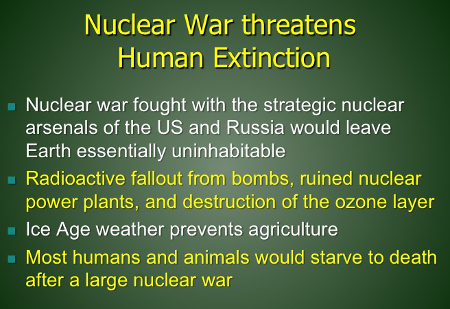 Their studies predict that a large nuclear war, especially one fought with strategic nuclear weapons, would create a post-war environment in which for many years it would be too cold and dark to even grow food. Their findings make it clear that not only humans, but most large animals and many other forms of complex life would likely vanish forever in a nuclear darkness of our own making. The environmental consequences of nuclear war would attack the ecological support systems of life at every level. Radioactive fallout, produced not only by nuclear bombs, but also by the destruction of nuclear power plants and their spent fuel pools, would poison the biosphere. Millions of tons of smoke would act to destroy Earth’s protective ozone layer and block most sunlight from reaching Earth’s surface, creating Ice Age weather conditions that would last for decades. Yet the political and military leaders who control nuclear weapons strictly avoid any direct public discussion of the consequences of nuclear war. 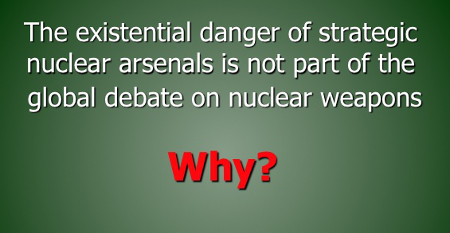 They do so by arguing that nuclear weapons are not intended to be used, but only to deter. Remarkably, the leaders of the Nuclear Weapon States have chosen to ignore the authoritative, long-standing scientific research done by the climatologists, research that predicts virtually any nuclear war, fought with even a fraction of the operational and deployed nuclear arsenals, will leave the Earth essentially uninhabitable. Some of the more recent of these scientific studies appeared in print almost 9 years ago. Yet their predictions have not been publicly acknowledged or discussed by any American or Russian President, nor by any of their top military leaders. In fact, none of the current leaders of any of the nations that possess nuclear weapons have ever made such a public acknowledgment. It is not clear that these leaders are even aware of the findings of this research, since they have consistently refused to meet with the scientists who did the studies. 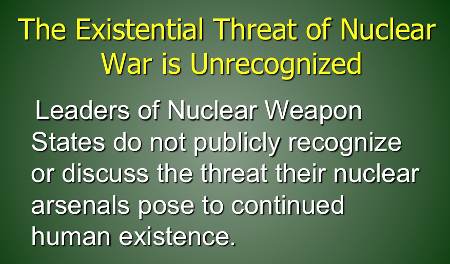 No Nuclear Weapon State has ever attempted to evaluate what consequences the detonation of their nuclear arsenals would have upon the global biosphere and ecosystems. 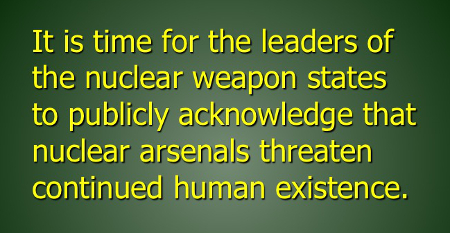 As a result, the grave threat to continued human existence posed by existing arsenals of nuclear weapons is a subject not included in the global debate on nuclear weapons. The existential danger of nuclear war has not been mentioned during American presidential campaigns or debates for more than 40 years. Such considerations have never been included in any military planning or as part of any national strategic review of US military force requirements. Why is this? According to our best scientists, the deployed arsenals of nuclear weapons pose a clear and present danger to the survival of our species. How is it that our leaders are unable or unwilling to even talk about this grave danger? In the 1980s, the American public was generally aware of the existential threat posed by nuclear war. That awareness no longer exists today. 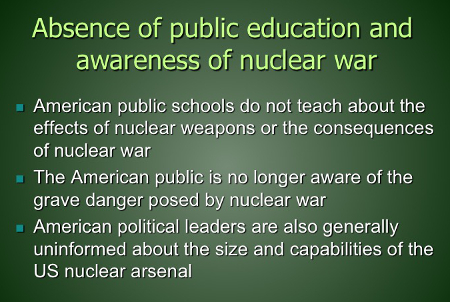 This is in part because US public schools do not teach students about nuclear weapons. A couple of generations of Americans have grown up with essentially no knowledge of the effects or consequences of nuclear war. This may be why our political and military leaders continue to focus upon the numbers of nuclear weapons rather than the consequences of their use. This makes no sense when a single ballistic missile now carries almost three times more nuclear explosive power than all the bombs that were detonated during World War 2. A universal ignorance of basic nuclear facts ultimately creates a very dangerous situation, because leaders who are unaware that nuclear war can end human history are likely to lack the gut fear of nuclear war that’s needed to prevent them from leading us into a nuclear holocaust. I teach an online class on nuclear weapons at the University of Missouri [Nuclear Weapons: Environmental, Health and Social Effects], and I get smart students but virtually none of them that come into my class know anything about nuclear weapons; they don’t know the difference between an atomic bomb and a strategic nuclear weapon, they don’t know that large arsenals of strategic nuclear weapons even exist. Without this basic knowledge, it is almost impossible for anyone to understand the immense dangers posed by nuclear war. Thus I am now going to take some time to explain these facts, to try to insure my message today is clear. WATCH FILM / READ COMPLETE TRANSCRIPT WITH SLIDES.